Ling Fell is one of the far north-western fells, sitting to the south of Wythop Mill on the edge of the Vale of Embleton. This is one of the smooth grassy fells to be found around the edge of the Lakes, but it sits slightly away from other high ground, making it a better viewpoint than many. The best views are north and north-west across the Vale of Embleton and out towards the north Cumbrian plains. To the south Wythop Moss dominates and the view further south is blocked by the fells around Whinlatter Pass. There is also a good view east towards the Wythop Valley with Skiddaw in the background. The fence that runs across the fell a few hundred meters to the west of the summit is a pest, with no stiles on my last visit, but it is possible to cross it with care and without damaging the fence. Ling Fell is access land, but rather lacks rights of way. Only two cross the full - one that runs across the western flank, but stops at the south-western corner of the fell and Green Lonning, which cuts across the north-western corner of the fell. There is also the remnants of a Corpse Road cutting across the northern slopes, but this comes to sudden end near the fence. 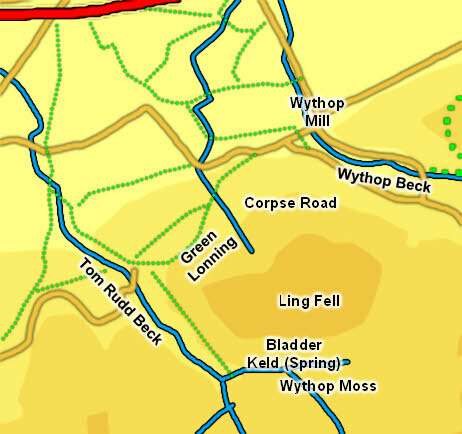 Another track runs around the eastern flank of the fell, branching off the Corpse Road near its eastern end. None of the slopes are really too steep to climb, so the walker can reach the summit from just about any direction (just be aware of that pesky fence). The summit is a fairly flat grassy area, with a trig point. Quite a few paths meet at the trig point, even if many of them don't seem to go anywhere! Wythop Moss is to the south of Ling Fell. This is crossed by a large number of becks, including one that runs along the southern flank of the fell, passing Bladder Keld spring and then turning north to run past the fell. At this point it is called Tom Rudd Beck. Tom Rudd Beck then flows west towards Cockermouth, and runs into the River Cocker in the southern part of the town. Nameless becks flow past the eastern flank of the fell and flow into Wythop Beck near Brumston Bridge. Wythop Beck then forms the north-western border of the fell, before flowing north trough Wythop Mill. The beck then turns east and flows into Bassenthwaite Lake (as Dubwath Beck (probably)). A number of becks rise on the north-western corner of the fell. These run north into the vale then turn east to join Wythop Beck on its way to Bassenthwaite Lake. The two different stream systems are separated by a gap of a fifth of a mile just south of Lambfoot, making this the watershed of the Vale of Embleton. All of the water to flow off Ling Fell ends up in the Derwent after the Cocker flows into it at Cockermouth.